How yoga teacher training transformed my life and generated radical self-healing. The best hot chocolate I've ever had was on a class trip to Madrid, Spain back in 2004. The trip was a whirl-wind experience, soaking up as much culture, and visiting as many sites as we could see in the 10 days we were there. One very found memory I have was the night one of our teachers took our group to a small little cafe, tucked in the winding streets of Madrid. Oh, how I wish I could remember that name of place; I'd be sure to go back if I visit Spain again. Their specialty was churro con chocolaté. The warm chocolate drink was nothing of the thin, watery hot chocolate of my childhood; this was a thick, dark and bitter concoction, essentially a drinkable ganache you could dunk the churros in. It was amazing. It was likely what turned me into a dark chocolate lover. For me, the darker the better; I love the rich and complex flavor of bitter dark chocolate. My Hot Cocao with Clementine recipe is an homage to the flavors of that Spanish treat. My version is much lighter; not the ganache-like consistency I had, but it does have that complex and bitter chocolate flavor which I brighten up with a squeeze of clementine. Perfect for vegans, or anyone trying to avoid dairy; it's topped up with a whipped coconut cream. Today is Day 2 of my little snow-day vacation. Framingham, MA got HAMMERED by Winter Storm Juno. The news reported my hometown got 33.5" of snow between late Monday night and early Wednesday morning. This blizzard is sure to be one I tell our children about one day. I got lucky; my office has been shut down for the second day in a row. I'm happy I had the time to kick back yesterday, because today was dedicated to the clean up. 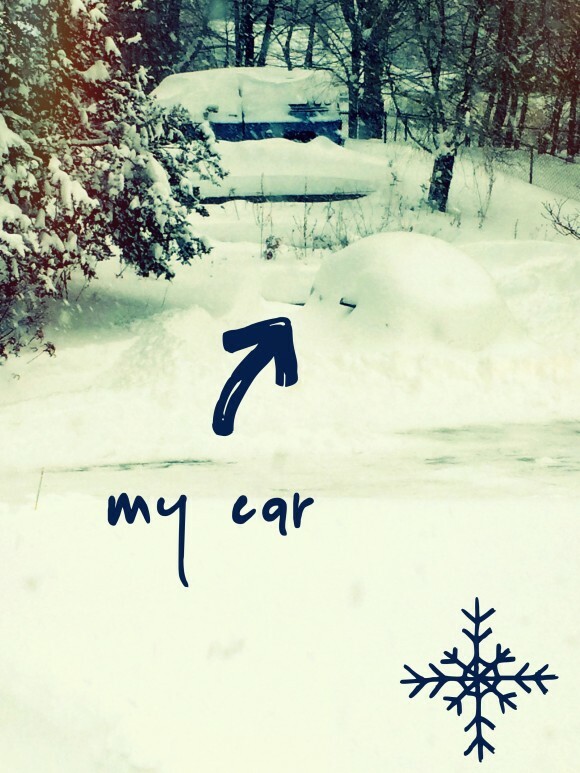 My car was buried in snow, and the task of unearthing it made me miserable. Our house has a garage, but it is so full of tools and junk there is no room for my car, which means, of course, a ton of work for me. It was grueling, annoying, and a workout; but I did it. I dug out my car, cleaned it off and it'll be ready to hit the road to work tomorrow morning. After being in the cold for so long my bones were aching for something warm. My 2nd favorite hot beverage, after coffee, is hot chocolate. When I was little, making a good hot chocolate was all about adding some Swiss Miss into warmed milk (instead of water) for a creamy and comforting treat. In the past couple of years, I've reduced the amount of dairy I consume. I first made the decision to drink more dairy-free milks, like almond milk, because I was looking for a way to cut calories, but I eventually realized, when I'd drink regular milk, the dairy free versions were much gentler on my stomach. It seemed to make a lot of sense, considering my parents switched me to soy formula as a baby, because I was quite colicey. Anyway, happy with my dairy-free milk, its proven to be a great base for hot chocolate. Now, I must call attention to the fact this is hot "cocao" not hot "cocoa". Raw cacao powder is unadulterated and contains many more nutrients than traditional cocoa powder. Pure, unsweetened cocoa powder tastes very bitter and rich, which is why it is most often used in sweets and confections. For more differences check out One Green Plant's article. I wouldn't say cocoa powder is worse than cocao, but the raw cocao powder was going to give me the flavor profile I wanted. To get my hot treat going I added 1 1/2 tbs of the cocao powder to the almond milk along with a tbs of honey and a dash of cinnamon. I use cinnamon all the time, I love the flavor and how it adds extra warmth to a dish. Cocao powder doesn't dissolve as easily as the powder from a hot chocolate mix, so you need to whisk the mixture as it warms over the stove top. The thing that takes this next level is clementine. Orange and dark chocolate have long been a classic combination (one I've usually hated). There was nothing worse, as a kid, to bit into a piece of chocolate to realize it was orange flavored. What I've come to realize, is that it wasn't so much the fruit mixed with the chocolate as much as it was the artificiality of the orange flavor... it always overpowered the chocolate in the candies I had. With orange being a classic flavor in churros, and a big box of clementines sitting on my counter tops, I sliced one in half and squeezed in the juice at the very end of my hot chocolate being ready. Come to think of it Grand Marnier would be fantastic in this, but I'm still committed to #DryJanuary. The best part of any hot chocolate is, of course the whipped topping. I love whipped cream. Any excuse I have to make it, I will. Nothing impresses people more as when I take out a chilled bowl, my biggest whisk, and whip it up by hand. Great upper body workout. I've seen and heard great things about whipped coconut cream, and had to try it for myself. I can attest that it is every bit as satisfying as the "real" stuff. To make the coconut whipped cream, you have to chill a can of full fat coconut milk in the fridge for at least an hour. This will ensure the cream separates from the liquid. After that, you prepare just as you would a standard whipped cream. Place the coconut cream in your stand mixer with a sweetener like coconut sugar or honey along with the vanilla extract. With the whisk attachment beat on high until it is whipped. Because coconut cream is more dense than dairy cream, it won't be as airy, but it will certainly be as creamy and delicious. Before assembling, I blitzed my hot cocao mix in my blender with two or three pulses. With the whisking I did, it probably didn't need it but I wanted to ensure that all the ingredients were incorporated and the drink was frothy. Feel free to omit that step in interest of getting to drink it. Fill your favorite mug and top off with a heaping helping of whipped coconut cream and sprinkle on some extra cinnamon and clementine zest for good measure. Pour almond milk into sauce pan over medium heat. Add cocao powder, honey (or other sweetener) and cinnamon. Use a whisk to incorporate the cocao powder with almond milk. It will take some time, as it doesn't instantly dissolve. You want to get the hot cocao up to approximately 112 degrees, carefully not to let come to a boil. You don't want to scald the almond milk. Right before taking cocao off the heat, squeeze in the juice of half a clementine (you can add the juice of a whole clementine if you'd like, or just snack on it on the side). (optional) Blitz mixture in a blender for a few seconds to get frothier and ensure all flavors are incorporated. You can also achieve this if you whisked the mixture on the stove. Allow can of coconut milk to chill in the refrigerator for at least 1 hour. Add coconut cream to a stand mixture with whisk attachment and beat as you would with regular cream. Add vanilla extract and coconut sugar (or some other sugar substitute). Continue to mix on high until you get a whipped cream texture. *I've made a lot of true whipped creams in my time and found the coconut cream, because it is more dense to begin with, does not become as light and airy as your standard, dairy based whipped cream. That said, it had excellent flavor and the texture (while thicker) was the perfect touch to this hot chocolate. The man running the mushroom stand was exactly how you'd might imagine... I was taken back to my trip to Bonnaroo in 2006 and had to laugh. The first thing that caught my eye was a bizarre looking mushroom that resembled a sea urchin and I had to learn more. It's called a Lion's Mane mushroom. The guy (super nice and helpful but I didn't get his name) tells me that the mushroom has a taste similar to lobster, with a texture like crab. I had to have one and he provided me with some extra information on the mushroom, including a recipe for a "crab" cake. I took the recipe and tweaked it a bit and have to admit he was 100% right. I could fool anyone with these little bites; no one would know I was serving mushroom! For the most part I remained true to the recipe that came from Mycoterra Farms with the exception of adjusting some of the measurements of ingredients and using Greek yogurt in lieu of mayonnaise as I preferred to use the Greek yogurt as a healthy, fat-free (unprocessed) substitute. An important note I learned was that raw, or undercooked, this variety of mushroom will taste quite bitter, and is best cooked slowly in a skillet or roasted. This recipe called for roasting the mushroom, so I followed suit. I chopped up the mushroom, perpendicular to the spines, as noted to retain the stringy seafood texture, tossed in some organic extra virgin olive oil and threw in my oven along with a large clove of garlic to roast at 350 degrees for 30-40 mins, turning part way. Mushrooms retain a lot of water, so they shrink quite a bit when cooked. I was so concerned about overcooking these that I pulled them out on the early side. I could tell they could use some more cooking so after I started sweating some diced onion on the stove top, I added the lion's mane to cook another minute. I put the mushroom, garlic and onion mixture in a food processor and pulsed 3-4 times just to break up the chunks. In a separate bowl I started adding the rest of the ingredients for the "crab" cake: 2 tbs Greek yogurt, 1 tsp soy sauce, 1 cup of bread crumbs, 1 egg, a generous amount of fresh chopped parsley, a splash of vinegar, splash of lemon and 1 tsp of paprika (and salt and pepper to taste). I gently folded in the the mushroom mixture with the other mixture to create the cake mix. All they needed was to be cooked! 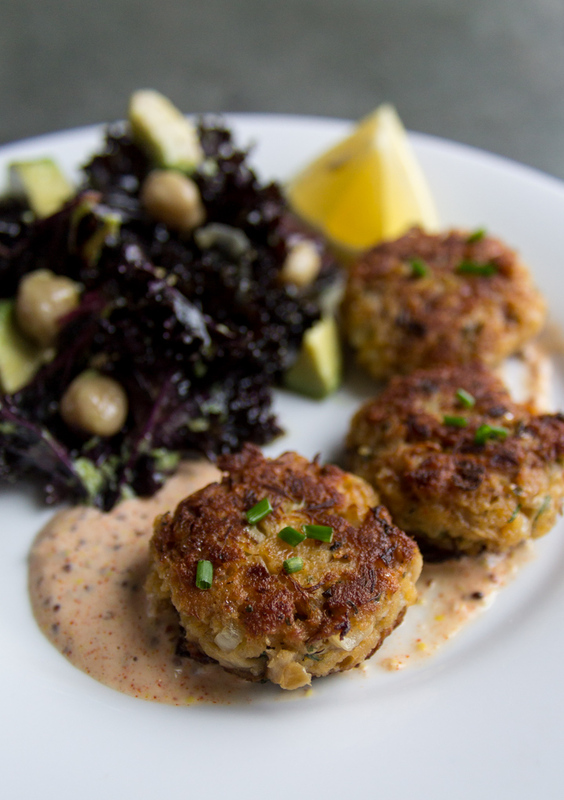 I'd imagine that you could bake these in the oven, but to really get the true texture of a crab cake they need to be pan fried. My go-to cooking oils are grapeseed oil and coconut oil - both have a high smoking point, meaning they can withstand high heat, without breaking down/burning (and becoming a carcinogen). I was out of grapeseed oil, so I used coconut oil and it worked perfectly. If you've never cooked with coconut oil, I'd highly recommend it. While the oil itself smells like coconut oil, I don't find in imparts a coconut flavor to what you are cooking. (pic) Look at these beauties! Out of the pan, I simply blotted off the excess oil and sprinkled a touch of sea salt on top. For dipping (because every good grab cake needs a sauce) I whipped up a quick 4 ingredient remoulade-like sauce and served my creation with a Purple Kale salad with avocado and chickpeas (I'll add a like to that recipe once I post it). Lion's Mane mushrooms are a vary rare variety, so the fact that I have access to them now this winter through the market means I'll be making and enjoying this recipe a few more times. I don't know about you, but I think this would make perfect game day grub for the big game a few Sundays from now! If you don't have access to lion's mane can you make this recipe? Absolutely! The unique qualities of the lion's mane do add that texture and slight taste you'd expect from a crab cake, but that's not to say you couldn't use this cooking method with a more common variety, like oyster mushrooms (which have a more mild flavor) and replicate something in the same vain. Go ahead! Be adventurous! As the "mushroom guy" said last week, "can you imagine the first person that decided it would be a good idea to try to eat one of these things?!" Curiosity can pay off. I'm very pleased I got over my aversion of mushrooms and discovered something so delicious to add to my cooking repertoire! Dice Lion's Mane mushroom into large pieces. Toss in olive oil and roast in oven, with garlic at 350 degrees for 30-40 mins. Turn halfway through. The mushroom will shrink substantially as the water cooks out. When ready, put mushroom and garlic mixture in food processor and pulse 4-5 times until mix is broken down in smaller chunks. In a separate bowl mix together the egg, soy sauce, Greek yogurt, lemon, chopped parsley, salt and pepper. Use a whisk to evenly mix the wet ingredients. Add breadcrumbs, onions* and pulsed mushroom mixture. *If you choose, you can saute the onions instead of using raw onions (this is optional). To do so, cook in a saute pan on medium-low with coconut oil, slowly sweating the onions until translucent (about 5-7 minutes). Use an ice cream scoop or tablespoon (depending on the desired size of the crab cakes) to measure equal portions of crab cakes. With your hands, form into cakes. Heat coconut oil in non-stick pan on medium heat and fry until lightly browned on both sides. For remoulade: Using a whisk, mix yogurt, mustard, parika, lemon juice and salt and pepper. The 2014 CSA from Warner Farms starts today! In a few hours I will be picking up my first week's haul of fresh produce. While most of you visit the site for recipe ideas, I thought this would be the perfect opportunity to share some other kitchen tips, like how to clean produce. 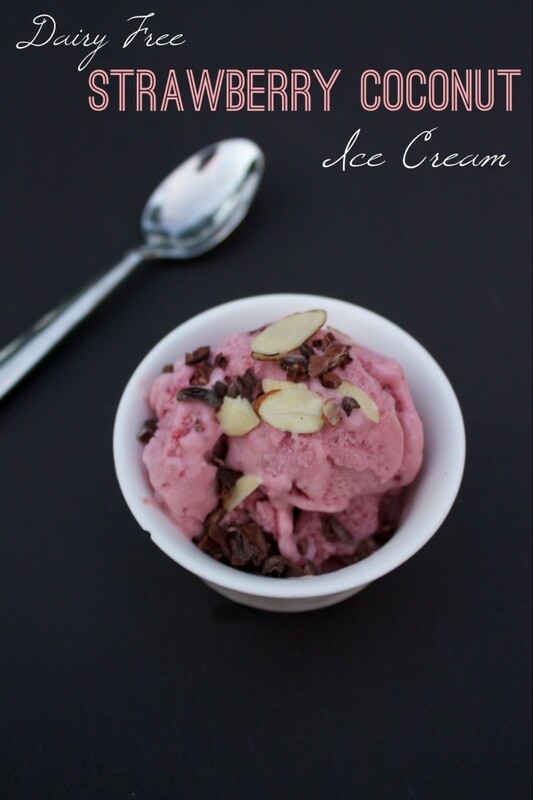 I also have a yummy, dairy-free ice cream recipe to share. Over the past few months I've tried to get into a better habit of prepping my food once I get home from the grocery store. I've let many whole pineapples and melons go bad in my time because I somehow never got around the dicing them up. Now, as soon as I return from the store with things like that, I'll prep and pop them in the fridge so the fresh fruit is ready to enjoy any time throughout the week. The same goes with washing fruit. I've come to learn that your fruit and veggies will keep longer when you clean them when you get home. Here is a really simple way to use Apple Cider Vinegar (ACV) to wash your fruit & veggies. I've notice special produce cleaners in the grocery store before, but have never purchased one before. I was always accustom to just rinsing everything off with water. Unfortunately water doesn't really cut it when you want to wash away harmful pesticides (if you arent buying organic) and killing off germs from potential e-coli contamination or even all the people who have touched that piece of fruit from harvesting, to shipping to a food distributor to the grocery store, the other customers checking out that piece of fruit, to the person ringing up your order. I don't want to gross you out, but really want to stress the importance of cleaning what you get from the grocery store BEFORE it goes into the refridgerator. The good news is, cleaning produce is easy and inexpensive. I've opted in for a more natual way, using RAW Apple Cider Vinegar. The most likley brand you will see in stores is made by Bragg. I pick out a medium size bowl, fill with water, and then add at least 1 TBS of ACV. There are many how-tos out there that will tell you what ration of water to ACV to use, but truthfully, I just eye it, and pour in a few small "glugs". I'll place the produce in the bath for 5-10 minutes (usually while I am unpacking other groceries or tidying up the kitchen). During this time, the enyzmes in the unpasterized, raw, apple cider is working magic, killing off germs and bad bacteria. 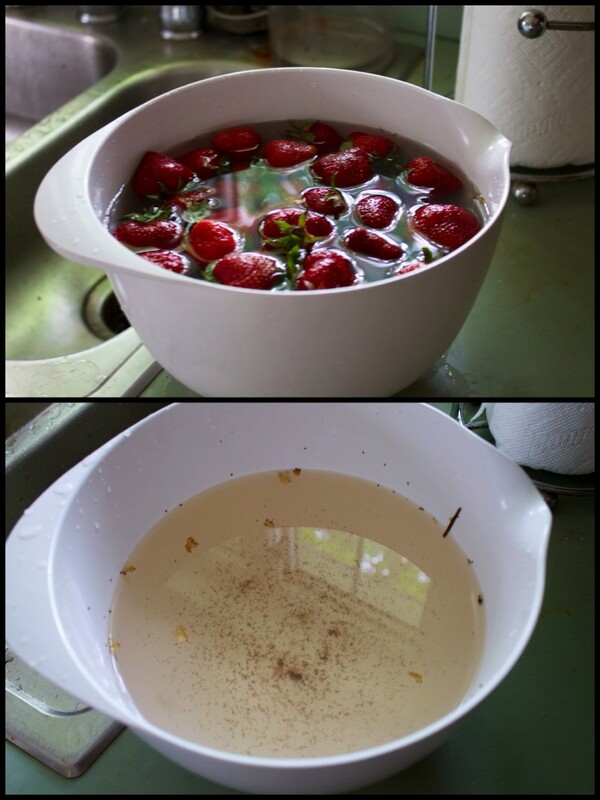 Above is a before and after picture of the water I used to clean the strawberries I got from Warner Farms on Saturday. To be perfectly honest, I thought the berries looked very clean when I got them, and it was tempting to dive right into them without cleaning, but look at how much dirt came off in just a 5 minute soak! After soaking in the water/ACV bath, rinse your fruit off with clean water, and let air dry before storing away in the refridgerator. You will feel ALOT better about what you are eating knowing that it is clean, plus it will last longer for you to enjoy. This batch of strawberries was only going to be stored overnight because first thing Sunday morning I got going on a dairy-free version of Strawberry Ice Cream. I love ice cream; who doesn't? Of course what none of us love is all the calories. While most of my favorite ice cream recipes are full of heavy cream, whole milk, egg yolks and sugar, I wanted to expand my repetoir and add a "clean" low calorie and dairy free option to the blog. I had two cans of coconut milk in my cupbard (one light and one classic with full fat) that I decided would be the perfect base for the ice cream. There is only a little cooking required and its very easy to adjust the sweetness as you see fit. Using the full quart of strawberries, I created a compote with dried dates and honey. While warm, I blended 3/4 of the mixture in a blender with the two cans of coconut milk and added the mixture to my ice cream maker. The tub of the ice cream maker must sit in the freezer over-night before its ready to churn anything into ice cream. I had mine ready to go and poured the strawberry/coconut mixture straight in. After churing for about 20 mins, a soft-serve like consistancey of ice cream had formed, meaning it was almost ready for the feature. With regular ice cream (using traditional cream) you have to be careful not to overchurn or else the ice cream will turn into more of a butter texture. There is no worries here with over churning a coconut milk based ice cream, but I wanted to make sure it was still soft so I could stir in the last 1/4 of strawberry compote. I liked being able to have small chunks of strawberry in the ice cream, but if you prefer a smoother texture, just blend everything together from the get go. Its tempting to dive right in, but you should let it sit the the freezer, in some sort of reusable container before you enjoy. The mixture turns rock hard once its frozen, so you'll want to give yourself 15-20 minutes to defrost when you are ready to eat. Top off with your favorite healthy toppings like almond slivers and raw cocao nibs for the chocolate lover in you. Set small pot to medium heat. Add chopped strawberries, dates and honey and let cook down to almost a syrup constitency (10-15 mins). Use the back of a spoon or potato masher to break up the strawberries to smaller pieces if you are planning to mix in some of the compote into the base. Take 3/4 of the mixer and place in blender with both cans of coconut milk. When you open the cans the "fat" will have risen to the top, with the clear coconut liquid on the bottom, scrap all into the blender. Blend until smooth. You can add all of the compote mixture if you do not like "chunks" in your ice cream. Place mixture into ice cream maker for about 20 minutes or until it starts looking like soft-serve. Mix in anything you want to add with a spatula at this point (remaining compote, nuts, etc). Let harden in the freezer at least 20 minutes before digging in. If you made it this far then congratulations! I know the idea of avocados in baked goods sounds crazy but trust me you may never go back to your old brownie recipe! The avocado makes these super moist and fudgey, and I promise you cannot taste the avocado. There are several substitute ingredients in this recipe. I try to eat as well as I can, but every once and a while you need to indulge. Even when I indulge I like to try to be somewhat "healthy". You know, have your cake and eat it too (a foodies favorite cliche). The first obvious substitute is avocado. Most brownie recipes call for canola oil or butter. This recipe uses avocado as the fat...but it's a healthy fat! Seriously though, over the last few months I've found myself removing canola and vegetable oil from my kitchen. I also use a lot less butter. We are so used to using ingredients because of the flavor it gives food, but you won't miss it here. The next substitute is almond flour for regular white wheat. Almond flour is used in many gluten free recipes. I'm not gluten free, but I thought it would be good to add a few gluten free recipes to my repertoire. I don't have anything against regular all purpose flour, but it also doesn't have any nutritional value. Nut flour on the contrary, has healthy fats and plenty of Vitamin E. It also has a low glycemic index as it is high in protein and low in carbs and sugar. Just so you are aware, almond flour is very calorie dense, so just because there are some healthy benefits with this alternative, doesn't mean you should eat a half a sheet of brownies in one sitting. The last substitute I used was coconut sugar. I had seen this in the baking aisle of one of my favorite stores and it sparked my curiosity. With further research I've found there a few notable benefits of swapping out your standard sugar for coconut sugar. First, coconut sugar has a low glycemic index (35) and doesn't cause blood sugar levels to spike as would traditional sugar. Secondly, regular sugar doesn't contain any vital nutrients and therefore is consider empty calories. Coconut sugar, on the other hand, retains quite a bit of nutrients such as Iron, Zinc, Calcium and Potassium. Now, calorie for calorie coconut sugar is the same as regular sugar. Although I find it to be a better choice, on a day to day basis I keep added sugars out of my diet - regardless of the type of sweetener. Now to get these brownies started! First you need to melt your chocolate chips. You can either do so in a microwave or over a double boiler. Pay close attention so that the chocolate doesn't seize. If you use the microwave method, heat for 20-30 seconds at a time, and stir. Once melted, set aside to cool slightly. Next, crack your 4 eggs into a mixing bowl along with the coconut sugar. Use a hand mixer or whisk to beat the eggs and sugar together. I'd let the hand mixer go for about a minute to help incorporate air into the eggs and sugar. To the egg and sugar mixture add the flesh of two ripe avocados. Use the hand mixer again to make sure the avocado gets really incorporated into the mix. Once you know the avocado is blended in, slowly add in the melted chocolate. Once combined, stir in the almond flour and cocoa powder. When I made mine I also added a tbs of instant espresso powder. Its a trick I use whenever I bake anything chocolate - it adds a really nice depth to the chocolate flavor. Unlike most baking recipes, you won't need to worry about over mixing since the almond flour is gluten free. 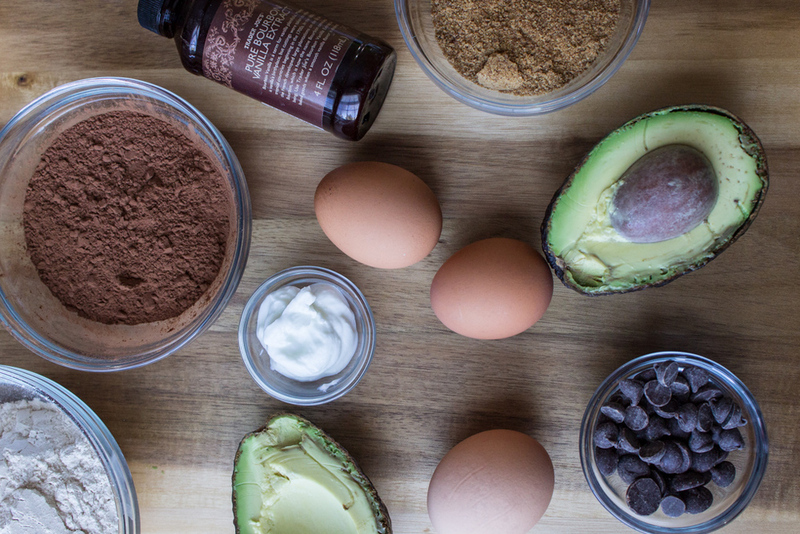 The avocado brownie batter is ready to be poured in the pan. One last thing before I put my batch in the oven was to stud the top with a small handful of chocolate chips. The original recipe said to bake 20-25 minutes at 350 degrees but I found I needed 30-35 minutes. I'd check at the 25 minute mark and keep a close eye on it. When they are ready they will fill your kitchen with the aroma of chocolate. It's hard to keep your hands off these but it's EXTREMELY important to let them cool completely (at least 20 minutes). The longer the better. Be sure to refrigerate leftovers. To be honest, I thought they tasted better the next day being chilled. I took the batch into work the next day because I knew I'd eat them all if I left them at home. People LOVED them! In case you haven't noticed, the holidays are here! After a wonderful Thanksgiving weekend, indulging in a few too many Pumpkin Chocolate Chip Latte Muffins, its time to get back on track with healthy eating habits. This is the time of year where most people's fitness and health goals are thrown out the window, accepting defeat long before Christmas Day is even here. If you are looking to get fit and healthy the worst thing you can do right now is push that off until the New Year. On average, Americans gain 7-10lbs pounds* between Thanksgiving and Christmas! I'm commiting myself to posting healthy recipes you can start enjoying today to help stay fit and healthy. One of my tips for maintaining a healthy diet is incorporating smoothies. I absolutely love smoothies, in fact I have at least one a day.To kick off December, here are TWO smoothie recipes for you to try. That’s right! We back on beets! If you saw our very first post for Roasted Beet Hummus you’re familiar with the health benefits of beet. If not, let me quickly recap how awesome these ruby gem’s are: they are packed with nutrients including potassium, magnesium, fiber, phosphorus, iron; vitamins A, B & C; beta-carotene, beta-cyanine; folic acid. They are a high source of energy, and also natural detoxers. You can read more about there benefits here and even more here. You get most of a vegetable’s or fruit’s nutrients when you eat them raw, which is why beets are fantastic in juices or smoothies. I haven’t gotten into juicing yet, I prefer smoothies, even if there is more “pulp” because I don’t feel like I’m wasting anything. One of the benefits of eating raw vegetables and fruits is for the fiber so why strain it all out? Speaking about waste - I like to use the beet greens as well. Now here me out, I know adding greens to your smoothie seems weird, especially if you haven't made a lot of smoothies before, but I'm telling you they are worth it. Yes, beet root (the red bulb we use) are full with nutrients, but beet greens have their own set of great vitamins and nutriets which help round out the recipe. Beet greens actually have a very mild flavor, so with all the other sweet fruits you are adding to the recipe, you will not taste it! The recipe only calls for a quarter cup of greens, but if you'd like to add more, by all means, bump the quarter cup up to a full cup. If you still are apprehensive about beet greens, try adding baby spinach instead, its slightly sweeter. The first recipe is for a Berry Beet Smoothie. I start off with a half of a medium beet, peeled. The juice from beets stain, so when you are peeling you're beet, don't be wearing white. If you don't want you're fingers and hands to get discolored bright pink, be sure to wear some gloves. I go roque, sans gloves, and just get my hands to the sink as soon as I can after peeling and chopping the beet. As the name implies, I then add a bunch of my favorite berries - a cup of raspberries and a half a cup of blueberries. Frankly, you can really add any combination you like - feel free to sub out for strawberries or blackberries, but keep the total fruit to 1.5-2 cups. I also add a half of a frozen banana. Banana's help to keep you full during the day, so my smoothies almost always have a half to whole banana. Once they are ripe, I chop them up and freeze them. A frozen banana adds some nice texture to the smoothie. Another key ingredient in a good smoothie, is fat. Yes, I said it, FAT IS GOOD... well, not all fats, but healthy fats, like Omega-3. Flaxseed serves a good fat to add to a smoothie with about about 1.8 grams of plant omega-3s in each tablespoon. I usually buy a ground flaxseed from Trader Joe's. I find that the ground version is much easier to incorporate into smoothies. Ground flaxseed is also easier for your body to process so you can absorb more of their nutriets. Lastly the Beet Berry Smoothie comes together with unsweetened almond milk (which if you follow Mindful Glutton, you know is one of the stables in our fridge). I like how the creaminess of the almond milk balances the acidity and sweetness from the fruit. Depending on the desired consitency and if you add ice to your smoothie, you may need more than a cup. Almond milk is so light in calories you are welcome to add a few more drops, but I usually end up just adding a few extra tablespoons of water if I need to. It wont dilute the flavor whatsoever. Here is a fun picture of the recipe you can post to Pinterest! Today is a double feature - so here is another recipe you can use that other half of beet for. This is a Tropical Beet Smoothie. I know its December, but when it starts to get cold here in New England, I sometimes like to remind myself of warmer weather. The tropical blend of fruits in this version does the trick. As with the first recipe, start out with a half of a raw medium beet. Next I add a cup of cubed pineapple and about a half a cup of mango to get those tropical flavors. Pineapple is a very assertive flavor, and does a really great job of masking the beet flavor (although mild to begin with). I also added about a 1/3 cup of raspberries because I had some left over from the Berry Beet Smoothie. Have you heard the phrase "eat the rainbow"? Its the concept that by eating fresh produce, of all different colors, you are getting a great variety of nutriets. Here we have reds, yellows, and oranges (and if you add beet greens/ spinach, green too). I use one of three liquids in my smoothies: water, almond milk, or coconut water. Going along with the tropical inspiration, this one uses coconut water. I don't enjoy drinking coconut water straight up (unless its the chocolate flavor), but its a great base for a smoothie. The coconut flavor is really mild. Where the real benefit comes from is the potassium and electrolytes in coconut water. Its incredibly hydrating. Hungover? Drink coconut water. Between the detoxing properties in the beet, and the electrolytes in the coconut water, this smoothie is a perfect way to flush out all the bad toxins after your holiday work party. The last addition is a half of tablespoon of chia seeds. You can put in a whole tablespoon, but if you haven't tried chia seeds before, I recommend starting with a half, since they pretty much stay intact after blending. As with flaxseeds, chia seeds are rich with Omega-3, a healthy fatty acid. They will also help you feel full faster, keep you hydrated, and give you lots of energy. Its said that chia seeds were a regular part of the Mayans and Aztecs diets because of the energy and stamina it gives. Warriors were said to eat a handful before going off to battle. So maybe we aren't fighting in any epic battles this season, but extra energy, without having to fill up on a high calorie caffeine drink from your favorite coffee ship is always a win. So here you have another great smoothie recipe in your aresenal. Enjoy! For either recipe, preparing your smoothie is as simple as putting all the ingredients into your blender, and blending until smooth. Be careful as you peel the beet, their juices will stain your clothes. You can choose to wear gloves if you'd like, but I just quickly wash my hands afterward to get the beet juice off. If you are adding ice to give your smoothie more texture, you can add extra water/ice to get the desired consistency. Before reading any further, please note there is nothing healthy about this recipe. If there is any time to indulge, its certainly on a holiday, so I baked Pumpkin Spice Latte Chocolate Chip Bread and Muffins. The original recipe was for bread, but is also the perfect batter for muffins. Pumpkin puree was a great addition to the Pumpkin Pie Smoothie for its nutritional value, but here, pumpkin puree serves as an ingredient that will make the bread (or muffins) incredibly moist. The first time I made the recipe was in preparation of our annual camping trip to Lake Winnepesauke. My husband, along with the other couple we go with are a little picky so I wasn't sure how they'd like "pumpkin" bread. I warmed a few of the muffins up by the camp fire so when you broke them apart the chocolate chips were gooey again. They were a huge hit. Unfortunately we had an accident with the loaf of bread, and it got soaked with water in the cooler and we had to throw it away. I've been baking a lot less this year. Its one of the ways I've been watching what I eat. So when I do bake, I invest in the best quality ingredients. The last time I made this recipe we were still getting fresh local organic eggs from our farm share. The taste and quality rival what you can find in a grocery store. With that, I've decided to stick with organic eggs. I'm also using organic flour, sugar and pumpkin puree. I read and hear a lot of dialog about the pros/cons (or more so contesting of the cons) of organic. Those against organic usually say its too expensive and that any "risks" of non-organic are minimal or over exaggerated. I don't exclusively buy organic, but when I'm presented both options, I usually go towards organic. I'd like to address the argument that organic "is too expensive", it isn't necessarily. I find Trader Joe's has a lot of great organic products at reasonable prices. I also buy little, if any,8 packaged or junk food. If you want to save money at the grocery store, shop the perimeter (fruits, veggies, dairy) - its also healthier. I'm glad to sacrifice the 10 for $10 dollar special on Cheeze-Its for a bag of organic flour. Secondly, even if the pesticides and chemicals in non-organic are so trace to present a threat, why would I want to eat just a little of it? All I know, is that between having a better diet, which consists of more organic food, and working out, my body feels great. This recipe has been slightly adapted from one I saw on a blog called Two Peas In a Pod. I've tweaked the recipe ever so slightly. I substituted some of the white sugar for brown sugar (just a half of a cup), and I've also substitute water for coffee to get that "latte" flavor. The original also calls for a cup of canola oil. Canola oil is extremely processed and goes rancid really easy and can act as a carcinogen. I'm still learning ways to substitute out icky products like these with other ingredients so I wasn't able to get rid of it completely. However I found a way to use Greek yogurt to replace some of it. You can use the following method in any of your baking. First, cut the amount of oil in half. Then replace each cup of oil you remove with 3/4 cup greek yogurt. There is only a cup of oil in this recipe, so if I cut that in half, I'd add 1/4 cup plus 2 tbs of the yogurt. The recipe itself comes together very quickly. Mix the dry ingredients together in one bowl and the wet ingredients plus sugar in another. Combine, and stir in the chocolate chips. The original recipe says the batter is enough for 3 loafs of bread, but I believe it would most likely make 2. Today I used the batter to make a dozen muffins plus one good size loaf of bread. I can't decide which one I like better. Fresh out of the oven the muffins develop a beautiful caramelized crust (thanks to the brown sugar) and are perfect with a cup of coffee. But the loaf of bread seems to retain its moistness a bit longer than the muffins and can be enjoyed throughout the week (if it lasts that long). I like baking this, having a slice or two, and leaving it at work or with friends so I'm not tempted to eat the entire loaf. Its truly a favorite of mine. Preheat oven to 350°. Spray the inside of your bread pan with cooking spray and sprinkle some flour on the inside. Shake to distribute the flour (so it sticks to the bottom and sides) and shake out the excess. If you are making muffins you can do the same thing with your muffin tin or line with paper cups. In a bowl, mix together the flour, cinnamon, nutmeg, baking soda, and salt. In a large bowl, combine sugar, pumpkin puree, canola oil, water, coffee, vanilla, and eggs. Mix until smooth. For a loaf of bread, bake 55-60 mins, or until its browned and a toothpick comes out clean. For muffins, bake time is 30-35 mins. Let rest for at least 15 mins before removing from the bread pan. *Calculated with MyFitnessPal - I weighed a single muffin and slice and determined between the muffins and bread loaf I had 22 servings and divided total calories by that. 'Tis the season where our healthy eating habits tend to go right out the window. With Thanksgiving coming up this week I wanted to create a great appetizer that was on the healthier side. These Thanksgiving Egg Rolls are great made from scratch but can also be a great way to use your leftovers this year! Most appetizers I see out at family gatherings are carb and fat heavy (and I'm just as guilty of making my fair share of them). We all know the difference between what is and isn't healthy, but who ever goes for the crudite spread at Thanksgiving? Your guests won't have to choose with these baked eggrolls filled with yummy healthy fall inspired ingredients. Just two of them are under 250 calories. You can't have Thanksgiving without turkey, and being a lean meat, it made a great starting point for the filling of these egg rolls. I had dried cranberries and a fresh green apple on hand and decides I'd incorporate those great fall flavors as well. The tricky part was thinking of a binder. Most party or game-day appetizers I see are filled with shredded or cream cheese, which usually sends the calorie count through the roof. Sweet potatoes are one of my favorite foods. They are nutrient rich, have a beautiful orange color that reminds me of autumn, and would be an excellent binder for the egg roll filling. I wanted to keep the ingredient list short, so the only other thing the filling needed was fresh thyme and sage, classic herbs used with poultry. For this recipe - I made everything from scratch. I roasted my turkey breast, boiled and mashed the sweet potatoes and added the extras (cranberries, apples, herbs). However, this can easily be adapted to use your Thanksgiving leftovers. The stuffing comes together in a pinch once the other ingredients are ready. Now comes the fun part, making the egg rolls. Typically you can find egg roll wrappers in the produce section of the grocery store. I choose egg roll wrappers because they are much lighter than using a pastry or pizza dough, and they are extremely easy to work with. I placed 3-4 tbs of the filling in each wrapper and rolled per the instructions on the back of the package. At 400° they only take 10-15 mins to bake until crispy. Finally, any good app needs a dipping sauce so I made a quick Mustard Yogurt sauce mixing a dijon mustard with low-fat greek yogurt and leftover thyme. If you "don't like" greek style yogurt, please give this one a chance. The taste of greek yogurt (especially plain) used to be revolting to me, but when mixed with mustard you wouldn't even guess the base of the dipping sauce was yogurt. You will save a lot of calories so you can leave more room for all those left over desserts. Put turkey breasts in baking dish or sheet. Drizzle with 1 tbs of olive oil and lightly season with salt and pepper. Add 1tsp of the chopped herbs over the chicken for extra flavor while roasting. Roast 30-40 mins to roast until it reaches an internal temperature of 165º. When ready, remove from oven and cover with foil. Peel and dice sweet potatoes. Add to pot and fill with water and bring to boil. Cook for about 15 mins until fork tender. Drain and return to pot. Mash sweet potatoes until there are no more lumps. Season with salt, pepper, and a dash of nutmeg. Mix pulled/shredded turkey, mashed sweet potatoes, diced green apple, cranberries and remaining thyme and sage into large bowl. Add 3-4 tbs of filling to each egg roll wrapper, and roll per instructions on back of package. Place egg rolls on baking sheet. Depending on how much filling you've added, you should get about 18 egg rolls. Beat egg with a tbs of water and use a brush to coat the top of the egg rolls. Bake for 10 mins, turn over, and bake another 5-8 minutes until the edges are crispy. The first post I'll be sharing is a recipe from another blog, Minimalist Baker. I choose to share this recipe for Roasted Beet Hummus because it was this recipe and blog that set me on the road to starting my own food blog. Incorporating beets into a hummus was an exceptionally clever idea and is a great way to introduce a seemingly strange vegetable into you diet. Earlier this summer, I joined a CSA program with Warner Farms to start incorporating more fresh veggies into my diet. I absolutely loved it. Each week I picked up my farm share, I felt like a contestant on the Food Network show "Chopped", receiving a "mystery box" full of ingredients. I was challenged each week to use all the fresh produce in meals that both myself and husband would enjoy. The farm share really sparked my creativity and fueled my growing passion of cooking. I knew I'd be receiving lots of vegetables I hadn't tried before. I grew up a pretty picky eater, which was one of the reasons I was struggling to get good nutrition into my diet. When I joined the CSA, I made a commitment to myself to stay open minded and try everything it had to offer. One of the first strange ingredients we got were beets. 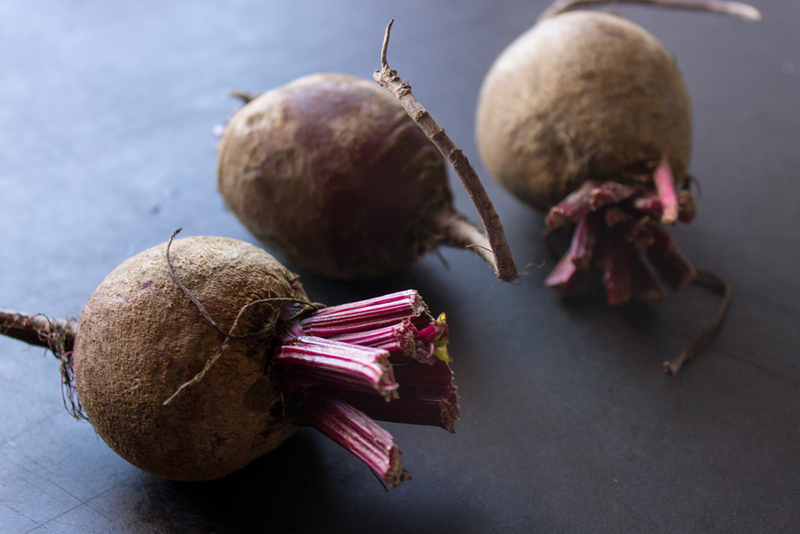 Warner Farms sent out a weekly newsletter and this week they included few recipes to give us ideas how to use our beets. A link to Minimalist Baker's Roasted Beet Hummus drew me with beautiful photography, capturing the bright pink hue of the hummus off set by the orange carrots and green cucumbers. It looks absolutely gorgeous and I just had to try it for myself. I explored her site and found it was filled with lots of amazing and simple recipes. She also had another thing that caught my attention, food photography e-courses and blogging resources. I'd taken several photography classes in high school and already considered it to be a hobby of mine, but needed some refreshers along with some food styling tips. The cost of the class was the best $19.99 I spent in a long time. It planted the seeds for this very here food blog! While the farm share sparked my creativity with cooking, Minimalist Baker rekindled my interest in photography. The two passions came together serendipitously with this here recipe. It only seemed right I feature it as my first post. So without further adieu, lets talk about roasted beet hummus! If you are unfamiliar with beets, to sum it up, they are a root vegetable that come in a variety of colors, but most often, a deep ruby. What a lot of people don't know is that beets are a super food. They are packed with potassium, magnesium, fiber, phosphorus, iron; vitamins A, B & C; beta-carotene, beta-cyanine and folic acid. They are excellent at cleansing/detoxifying the body, and are a high source of energy. They are just too good for you not to have if you are looking to have a mindful eating lifestyle. 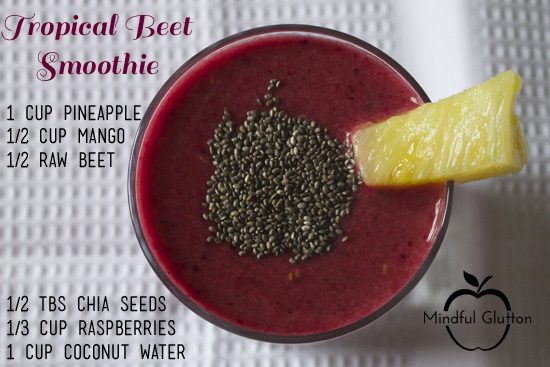 A great way to introduce yourself to beets is by mixing or blending them with other foods - which makes this recipe perfect. I don't think beets have a very strong taste as it is, but if you are worried about it, the lemon and the garlic in this dish become the most prominent flavors. Simply, roast a few fresh beets, peel and dice. Add them to a food processor along with garlic, lemon juice and ingredients you'd find in a traditional hummus, like chickpeas, tahini (sesame paste) and olive oil and blend! The end result is a bright and garilc-y hummus perfect for dipping veggies or a spread in a sandwich. The deep red hues of the beets turn the hummus bright pink making the dish a real show stopper. What a perfect dip for a bridal shower, bachelorette party or baby shower! Impress all you friends and bring it to your next cocktail party. Roast the beets ahead of time. Rinse the beets and cut off the stems. Wrap them in foil and roast in a 375°F oven for 50-60 mins. Let cool before handling and peel with a pairing knife. Add cooled, roasted beets in food processor. Pulse to break up . Add the chickpeas, lemon juice, garlic and tahini and blend until smooth. Lastly, slowly drizzle in olive oil, while blending, until you reach the desired consistency.